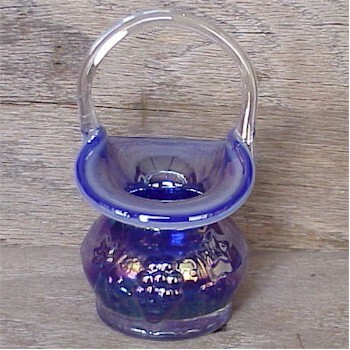 Cobalt Grape Vine Mini Basket, Bargain Shack offers Boyd Glass, Mosser Glass, L.G. Wright, and Contemporary Collectible Glass including Vaseline Glass - J.B. Scottie Dogs, Pooche, Animal Covered Nests, Toothpick Holders, Salts, Glass Animal Figurines, Clowns, Dolls, Slippers, Vehicles, and More! This beautiful Grape Vine Basket is so pretty in the color Cobalt Carnival. It simply shines with rainbow colors. The Gibson Glass tradition of quality craftsmanship shows on this 4-3/4 inch tall basket and the bottom is stamped Gibson 2003. The factory is closed so if you collect glass baskets you will want to add this one to your collection.